Roasted Asparagus with Gorgonzola is a simple yet incredibly delicious side dish that’s just as perfect alongside a weeknight dinner as it is for a romantic meal for two. This roasted asparagus and gorgonzola side dish is one of my favourite ways to enjoy this glorious green veg and at this time of year when asparagus is at low cost, I can’t get enough of it! The supermarkets are very seasonal here in Italy and at the moment there is an abundance of asparagus. So I’m stocking up on lots of green asparagus and adding it to my favourite dishes such as risotto, simple pasta dishes, sides, and crostini. I made a delicious crostini recipe last week with creamy spinach, prosciutto, and asparagus, I’ll post the recipe for you very soon because I know you’ll love it! Now let’s talk about CHEESE, my favourite topic of conversation. 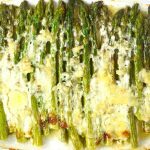 This mouthwatering roasted asparagus side is roasted with one of my absolute favourite cheeses, gorgonzola dolce! There are two types of gorgonzola; gorgonzola dolce which means ‘sweet’ in Italian or gorgonzola piccante which means ‘spicy or hot’. Personally, I love both (obviously) but gorgonzola dolce works best in this recipe. 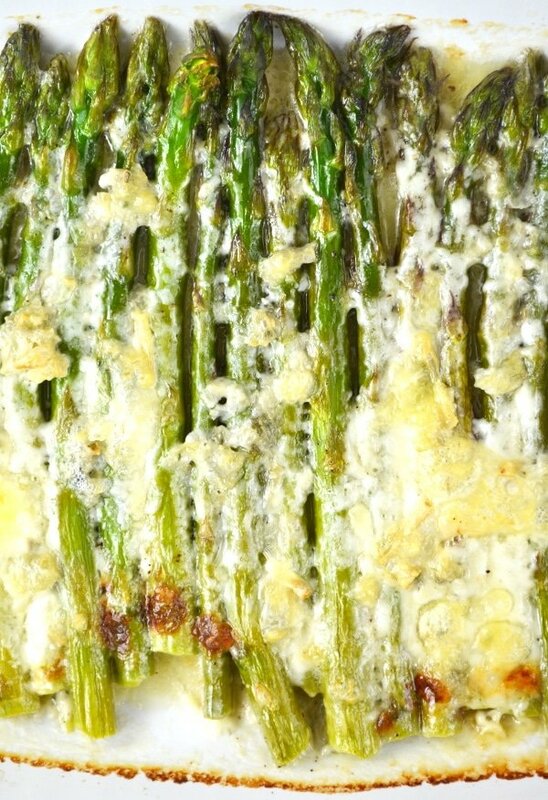 It’s a lot creamier and melts perfectly over the asparagus. FYI just in case you didn’t know, gorgonzola picante is not spicy or hot in flavour at all. It’s firm, crumbly and is an incredible strong blue cheese. What’s your favourite cheese? Tough question I know, I don’t know if I could answer that myself. There is a cheese for every mood in my opinion. As you can imagine this is such a simple recipe. Firstly I remove the woody part of the asparagus stalk by bending it and letting it snap naturally. Then the asparagus is boiled very quickly for 2 minutes and then plunged into cold water to keep its bright green colour. The asparagus is then dried and placed in an oven proof dish. It’s sprinkled with a little salt and pepper then the little cubes of butter and gorgonzola are dotted over the dish. 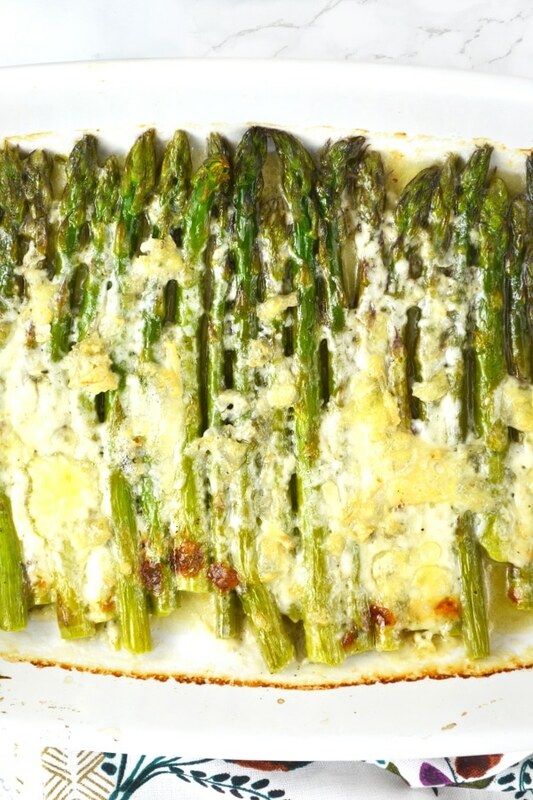 It’s placed in the oven for around 20 minutes until the gorgonzola has melted perfectly and the asparagus is cooked through. Serve this with grilled chicken and potatoes or steak. You can also add some walnuts or breadcrumbs to the dish for extra texture or try using taleggio cheese if gorgonzola is too strong for you. Preheat the oven to 180°C/350F/gas mark 4 and bring a pot of water to the boil. Bend each asparagus stalk near the bottom and let it snap naturally, alternatively cut off the woody end of each asparagus. Boil the asparagus for 1-2 minutes then plunge into cold water to stop them cooking. You want the asparagus to retain their bright green colour. Dry the asparagus then add to an oven proof dish. Sprinkle with a pinch of salt and pepper then dot with cubes of butter and Gorgonzola. Roast in the oven for 15-20 minutes until the cheese has melted and asparagus is cooked through. Serve with grilled chicken and potatoes or steak. Add breadcrumbs or walnuts for extra texture. Try using taleggio cheese if Gorgonzola is too strong for you. Never tried the blue cheese and asparagus combination but its highly intriguing! The gorgonzola dolce you speak of is it the one with the layers of mascarpone in between? Ah no it’s not that one although that’s SO delicious too. Gorgonzola dolce is just slightly softer and more creamy but looks very similar to gorgonzola piccante. What an easy-sounding yummy recipe! So perfect for brunch. Grazie! It would be great for brunch, thank you Rebecca! Gorgonzola cheese makes me so happy! I love this idea, a great twist on the typical Parmesan!